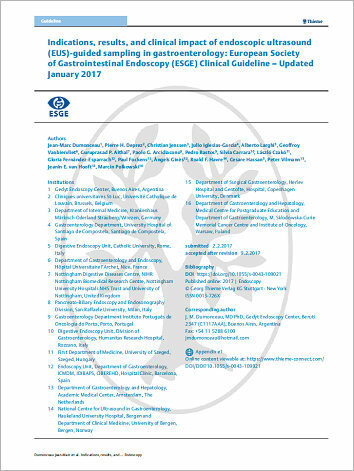 For pancreatic solid lesions, ESGE recommends performing endoscopic ultrasound (EUS)-guided sampling as first-line procedure when a pathological diagnosis is required. Alternatively, percutaneous sampling may be considered in metastatic disease. In the case of negative or inconclusive results and a high degree of suspicion of malignant disease, ESGE suggests reevaluating the pathology slides, repeating EUS-guided sampling, or surgery. In patients with chronic pancreatitis associated with a pancreatic mass, EUS-guided sampling results that do not confirm cancer should be interpreted with caution. For pancreatic cystic lesions (PCLs), ESGE recommends EUSguided sampling for biochemical analyses plus cytopathological examination if a precise diagnosis may change patient management, except for lesions ≤ 10 mm in diameter with no high risk stigmata. If the volume of PCL aspirate is small, it is recommended that carcinoembryonic antigen (CEA) level determination be done as the first analysis. For esophageal cancer, ESGE suggests performing EUSguided sampling for the assessment of regional lymph nodes (LNs) in T1 (and, depending on local treatment policy, T2) adenocarcinoma and of lesions suspicious for metastasis such as distant LNs, left liver lobe lesions, and suspected peritoneal carcinomatosis. For lymphadenopathy of unknown origin, ESGE recommends performing EUS-guided (or alternatively endobronchial ultrasound [EBUS]-guided) sampling if the pathological result is likely to affect patient management and no superficial lymphadenopathy is easily accessible. In the case of solid liver masses suspicious for metastasis, ESGE suggests performing EUS-guided sampling if the pathological result is likely to affect patient management, and (i) the lesion is poorly accessible/not detected at percutaneous imaging, or (ii) a sample obtained via the percutaneous route repeatedly yielded an inconclusive result.